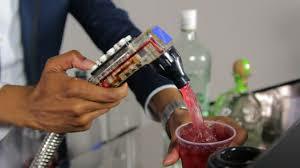 A soda gun or sometimes referred to as a bar gun is a device used by bars to serve various types of carbonated and non-carbonated drinks from 1 to 14 flavors while holding it in the palm of your hand. This gun can produce and dispense Sodas, Juices, Teas, Lemonades, Wines, Energy drinks as well as carbonated and plain water. This post-mix bar gun combines concentrated syrup from a bag-in-box and mixes it with filtered or regular tap water, either carbonated or non-carbonated, at the point of expense. For a post-mix soda gun to function it must be connected to a bag-in-box system, including pumps, a chiller or ice cooling plate, water filtration system and a carbonator. Due to the complexity and expense of purchasing and properly configuring the entire system that runs the soda gun, in most cases the restaurant or customer relies on their beverage supplier to supply the equipment and handle the installation and maintenance of their bar gun system. Also available – Fast Flow Single Product Dispenser for Margarita, Lemonade and Teas. The Great American Beverage Co. has been using, installing, selling and leasing The Wunder-Bar Hydraulic Post Mix flex hose for all type of drink dispensing since their beginning. Wunder Bar dispenser are available with permanent, quick disconnect or flow-regulated type manifolds and in many different corporate franchise colors. Flavor Button caps are available in numerous colors and ID’s. 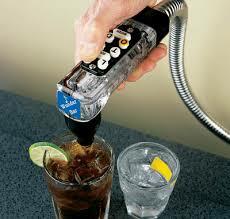 Bar Guns are also field convertible at any time from carbonated to non-carbonated, wine and straight flavor shots. 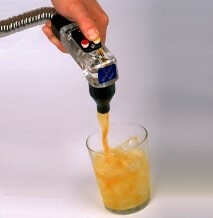 Also available – Wunder-Bar Juice dispensers from 5 to 12-products. These dispensers also include the two water metering screw adjustments. The newest addition to the Wunder-Bar flex hose family is our new Energy Drink dispenser. 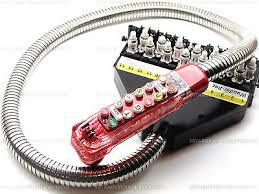 One or two-button dispensers include barrier tubing for product positions.